NEW DELHI: Nabil Khemir, a multi-talented Tunisian -born musician has signed with Guitarmonk Records for his Album and also for events opportunities in India. Khemir has created an exclusive one of a kind musical instrument that sends out a radiance of harmony as it blends the guitar and lute on a single medium, thus he named it, "Rayjam." This special instrument enables him to probe and expose the playful side of his music. For him, it is one amazing dream that has materialized. Khemir's musical foundation has been largely influenced by the entrancing sound and rich cultural legacy of North African Egyptian music. As a young boy, Khemir showed a strong desire to create unique music through his own voice and musical instruments. His wish was granted on his 9th birthday when he received his first musical lute. And as he continued to hone his talents, he was rendered as a child prodigy with a bright future in the music field. He later on learned more from the wings of the famous lute player Ali Sriti and also through exposure to the recordings of great Western jazzmen like John McLaughlin, George Benson, John Coltrane and other artists as well. 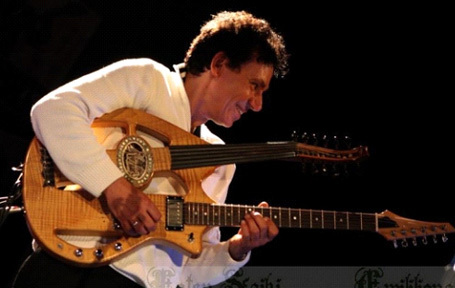 With such ardent passion to own an instrument that would truly reflect his mind and soul in music, he developed a unique hybrid instrument. After years of research and development, he finally came up with his very own double neck lute/guitar instrument which he named, "RayJam." By the year 2007, he participated in the American music contest for creation and improvisation. Nabil was awarded for his composition Parfum d' orient et d' occident. In 2008, he was presented with the medaille of culture from Tunisia for the outstanding contribution and honor he has given to his homeland.